John Kelman has written a great review of the new Return To Forever live album Returns for All About Jazz. Remember Return To Forever's triumphant reunion tour last year? I sure do. Well a live album entitled Return To Forever Returns has been produced from the tour, and it's being released March 2nd. A DVD is in the works as well (no street date yet). I've read on the internets that this album has had a rocky journey on it's way to being released. Regardless - As long as it comes out, that's all that matters. This is one I'll definitely be picking up. Lots of great Return to Forever coverage at All About Jazz lately. They've just posted an interview with all the band members. Really a great piece, check it out. 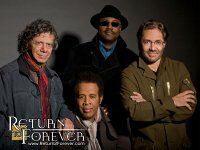 C. Andrew Hovan has written a great review of Return to Forever's June 24th show in Cleveland for All About Jazz. Geoff Anderson has written a great review of Return To Forever's June 3rd show in Denver for All About Jazz. John Kelman has written a fine review for All About Jazz of the new Return to Forever: The Anthology release.